Redlands, California—Pacific Disaster Center (PDC) is using the Esri platform to track the outbreak of the Zika virus on a global scale. By sharing mapped intelligence with health services and aid responders, PDC is able to provide essential information that defines the characteristics of the virus and its carrier’s breeding grounds. 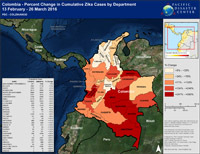 "Esri provides the backbone for visualizing an event and understanding the locality and context for any disaster, including the Zika virus," said Ray Shirkhodai, PDC executive director. The center provides situational awareness information for all manner of disasters. Esri, the world leader in geographic information system (GIS) software, creates technology that generates smart maps derived from a wide variety of data resources and then publishes them across information networks. PDC uses these capabilities to add different data layers—hospital density, rain, vector programs, and so forth—to maps. Maps make it easier and faster for disaster managers to understand the scope of a region's vulnerability to disease. The center serves its map products around the world to organizations that depend on it for intelligence about specific regions. "Esri GIS technology specifically allows us to characterize the Zika virus outbreak and contextualize it for decision makers," explained Dr. Joseph Green, PDC's health risk specialist. "Our maps describe the distribution of suspected cases at national levels throughout Latin America and the Caribbean." PDC gathers Zika virus information from weekly epidemiology updates and bulletins obtained from health organizations worldwide. In return, the center publishes regular updates, including online maps that track the increase and decrease of reported and suspected cases over time. The solution to containing the Zika virus is to dispose of mosquitos, which carry the disease. Mapping regional vulnerabilities to virus outbreaks highlights the value of mosquito management programs. Learn more about using GIS for vector-borne disease surveillance and control at go.esri.com/vector-ready.